Sharpe is one of those great British TV series that manages to unite the sexes. Men love it because it’s about wartime, features loads of battles and shooting the French. Women love it because of Sean Bean. Not to sound too sexist with this, but a little Sean Bean goes a long way – and his rough and ready Richard Sharpe set women’s pulses racing in their millions when ITV first aired Sharpe’s Rifles back in 1993. This DVD boxset (the UK version, not the really cool American version with the crate packaging and map) contains the original 14 episodes of Sharpe and was released one episode at a time, starting in 2002, before this packaged set gained a separate release some time later. 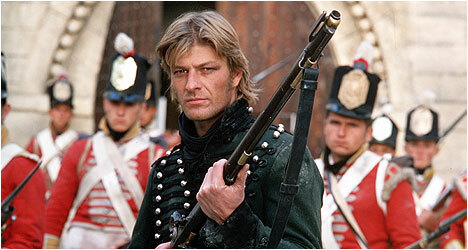 The series is set during the Napoleonic War at the start of the 19th Century, and centres around a British sergeant named Richard Sharpe (Sean Bean). Sharpe saves the life of General Sir Arthur Wellesley (soon to be Lord Wellington), single-handedly killing three Frenchmen in the process. This is more impressive than it perhaps sounds considering that the rifles used at the time could only fire one shot before needing reloading, and even the best soldiers at the time could only manage two rounds per minute. As reward for his bravery, Sharpe is promoted by Wellesley to the rank of lieutenant, and given command over a group of men in the 95th Rifles, including a rather belligerent chap named Sergeant Patrick Harper (Daragh O’Malley). The problem Sharpe initially faces is that, being raised from the ranks, neither officers nor soldiers want anything to do with him. The officers think he is common and not gentleman (and they’d be right) and the soldiers think he’s not a proper officer and will get them all killed. It’s this initial conflict that drives the first episode, Sharpe’s Rifles, as Lieutenant Sharpe must contend with mutiny in the ranks, and a disliking from other officers, if he is to survive. Naturally survive he does, and he endures many adventures (most of which being based on the books by Bernard Cornwell). Throughout the course of the 14 episodes (all filmed for a 2 hour timeslot on ITV, so are effectively feature films in their own right) Sharpe marries 3 times, gets promoted up as far as Lieutenant Colonel and performs a great many heroic deeds, much to the annoyance of the French (and many of the English officers). Sharpe is very much a man’s man, and doesn’t care whether he offends anyone (including ladies) which accounts for much of his charm. If he’s not telling ‘fops’ to ‘get off their bloody horse’, he’s given ladies compliments on their cleavage (as he does to Liz Hurley, who plays a former flame and a prostitute in one episode and is forced to undress in front of him). Other guest appearances of note include Daniel Craig as a no good British officer, Alexis Denisof (from Buffy and Angel) as a cowardly officer who steals Sharpe’s wife and Brian Cox as a devious Irish Major. It’s Sean Bean’s performances in Sharpe that saw him tipped to play James Bond (before Brosnan finally got the nod) and then to appear as a 00 agent in Goldeneye. Sharpe is fantastic entertainment, whether you’re interested in the historical aspect of the Napoleonic Wars, or whether you just like to see a northern hero sticking it to the Frogs (as Sharpe himself calls them). The boxset is also great value for money in the UK, with 14 DVDs included. This is a little disappointing as the Sharpe’s Legend documentary that is included with another boxset release is absent from here, so you only really get photo galleries. There’s not even an episode guide booklet, so unless you have the outer box itself you can’t even tell which episode comes next in the sequence as the DVDs aren’t even marked with volume numbers. Don’t let the absence of special features put you off though, this is British television at its absolute best – and better yet, there are another two episodes of Sharpe that were made after this release so you can get another fix once you’ve watched all of these.